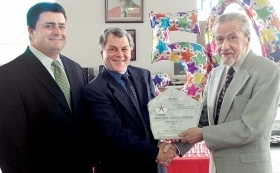 Rodney Udd, pictured above, right, of Anchorage Chrysler Center in Anchorage, Alaska, receives a 50-year award from Kelly Linn, center, Chrysler Group's Alaska dealer operations manager; and Steve Wagner, senior manager of sales operations at Chrysler Group's West Business Center. 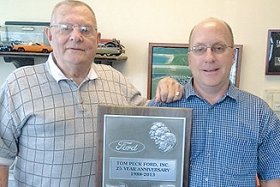 Tom Peck Sr., left, and Jim Peck of Tom Peck Ford in Clinton, Wis., received a 25-year award from Ford Motor Co. Tom is founder; Jim is president. 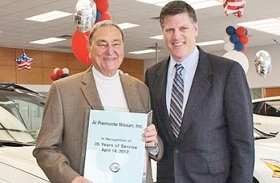 Al Piemonte, left, of Al Piemonte Nissan in Melrose Park, Ill., receives a 35-year award from Bryan Dumais, Nissan North America's Midwest regional vice president. 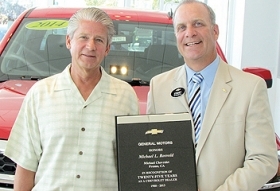 Michael Rosvold, left, of Michael Chevrolet in Fresno, Calif., receives a 25-year award from Mike Stinson, Chevrolet's northern California zone manager.